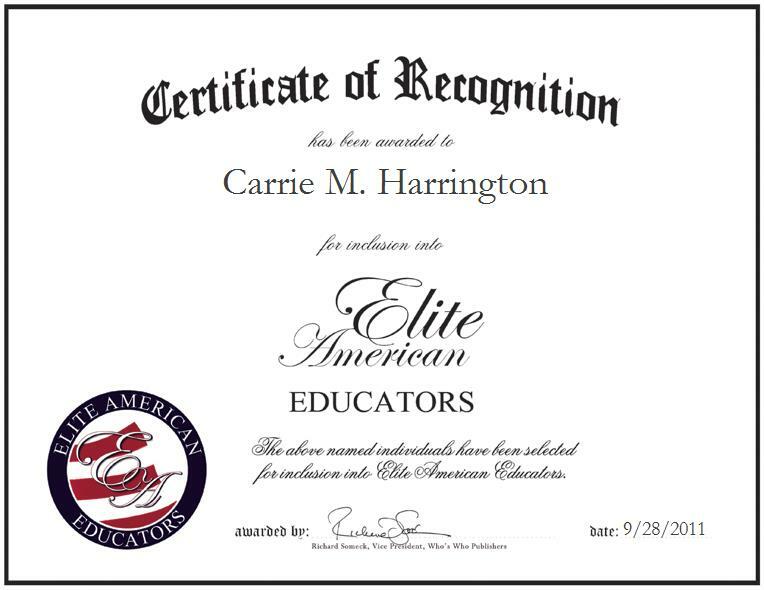 FORT WORTH, TX, September 28, 2011, Carrie M. Harrington, Director of the World Languages Division for the Fort Worth Independent School District, has been recognized by Elite American Educators for dedication, achievements, and leadership in teacher recruitment. Within the Fort Worth School District, Ms. Harrington oversees all foreign language programs and classes. By working closely with teachers, she aids in developing curriculum, and mentoring and educating professors. Backed by 38 years of experience, 12 of which she has served at her current post, Ms. Harrington is tasked with hiring new language teachers for the district. In fact, she retains an expertise in teacher recruitment that has enabled her to contribute to the quality of staff throughout the district. “This work is my passion and my calling,” states Ms. Harrington, adding “My concern is always about the individual, how they connect with the language and the culture, it’s who I am, and it’s a driving force in my life.” For her vocational excellence she has been the recipient of numerous awards. Among them are the Bayard H. Friedman Hummer Hero Award (2007), a Pier I Imports Award (1996), and a French Teacher of the Year Award (1987). A benevolent individual, she lends her support to the First United Methodist Church, P.E.O. Sisterhood, Kids Who Care, Inc., the American Heart Association, Sister Cities International, and Rotary International, for which she is a chapter president. Ms. Harrington’s education has been a great determinant of the knowledge she has bestowed onto others. In 1980, she earned a master’s degree in French from Middlebury College, after receiving a bachelor’s degree from Trinity University in San Antonio.